The Shamarpa (Tibetan: ཞྭ་དམར་པ་, Wylie: zhwa dmar pa ; literally, "Person (i.e. Holder) of the Red Crown"), also known as Shamar Rinpoche, or more formally Künzig Shamar Rinpoche, is a lineage holder of the Karma Kagyu school of Tibetan Buddhism and is regarded to be the mind manifestation of Amitābha. He is traditionally associated with Yangpachen Monastery near Lhasa. 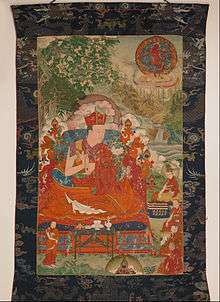 The first Shamarpa, Drakpa Senggé (Wylie: grags pa seng+ge , 1283–1349), was the principal disciple of Rangjung Dorje, 3rd Karmapa Lama. Rangjung Dorje gave this disciple a ruby-red crown and the title "Shamarpa", establishing the second line of reincarnate lamas in Tibetan Buddhism, the Karmapa being the first. In 1792 the Tibetan government found the 10th Shamarpa guilty of inciting a war between Tibet and Nepal. He was exiled from Tibet and a ban placed on his future incarnations, thereby abolishing the Shamarpa line. A modern Tibetologist proved this interpretation of history to be wrong and showed that the Shamarpa mediated in this conflict. The comment of H. H. The Sixteenth Gyalwa Karmapa on this period was: "Merit was becoming smaller and smaller. There was much political interference. Black was becoming white. The real was becoming unreal. 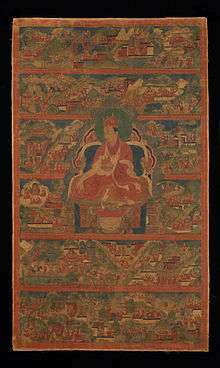 At that time it was not practicable to have any Shamarpa recognised or enthroned. Everything was kept secret. The incarnations appeared, but were not revealed." In 1963, following a request from the 16th Karmapa, the Tibetan Government in Exile lifted the ban. The 14th Shamarpa was Mipham Chokyi Lodro, born in Derge, Tibet in 1952. At age four he was recognized by his uncle, the 16th Karmapa, as the reincarnation of the previous Shamarpa. In 1964 he was officially enthroned in Karmapa's Rumtek monastery. At this occasion the Karmapa wrote a poem: "The most exalted, the lord of the lands of snow is Avalokiteśvara. The coalescence of his essence is the glorious Karmapa. Inseparable from his three mysteries, in the manner of the three lords, Is his manifestation, the great emanation; the majestic sun, Whom I invest now sovereign of the practice lineage's order. By the power of scattering auspicious flowers of excellent virtue Combined with the true words of the ṛiṣhi's truthfulness May he successfully and everlastingly be the sovereign of the order." He remained with the 16th Karmapa until his death in 1981. He received the entire cycle of Kagyu teachings from H.H. 16th Karmapa. After the death of the 16th Karmapa, Shamarpa recognized Thaye Dorje as the 17th Karmapa in 1994. His choice was backed by great masters as Chobkye Tri Rinpoche, Lopön Chechu Rinpoche, Lama Gendün Rinpoche, the 16th Karmapa's European representative Jigme Rinpoche and many others. Ogyen Trinley Dorje is held to be the 17th Karmapa by a majority of other major teachers of the Karma Kagyu lineage (including the 12th Situ Rinpoche, the 12th Gyaltsab Rinpoche, the 7th Dzogchen Ponlop Rinpoche, the 9th Thrangu Rinpoche, the 7th Mingyur Rinpoche) along with Sakya Trizin (head of the Sakya Lineage), who acknowledges Ogyen Trinley Dorje as well and the 14th Dalai Lama. (see Karmapa controversy). Shamar Rinpoche died on 11 June 2014 in Germany. ↑ Karmapa International Buddhist Institute's translation team. "A Brief History of the Karmapa-Shamarpa Lineages". Archived from the original on May 9, 2008. Retrieved 2008-05-23. ↑ "grags pa seng+ge". Tibetan Buddhist Resource Center. Tibetan Buddhist Resource Center. Retrieved 29 May 2015. ↑ Yeshe Dronma: The Kunzig Shamarpas of Tibet 1992, P. 19. ↑ Autobiography of the Fifth Dalai Lama. 3 vols. Lhasa: bod ljongs mi dmangs dpe skrun khang, 1989, Vol. 2. P.359, cit. in: Shamarpa (2012). A golden swan in turbulent waters : the life and times of the Tenth Karmapa Choying Dorje. Lexington: Bird of Paradise Press. ISBN 978-0988176201. ↑ Khenpo Chodrag Tenpel. "A brief account of the successive Shamarpa reincarnations". Retrieved 2008-05-23. 1 2 3 "The Shamarpa Reincarnations". Retrieved 2008-05-24. ↑ Norbu, Thubten Jigme and Turnbull, Colin. 1968. Tibet: Its History, Religion and People. Reprint: Penguin Books, 1987, p. 272. ↑ Schaik, Sam van: Tibet – A History, Yale University Press, 2011. ↑ Douglas Nik, White Meryl : Karmapa, the Black Hat Lama of Tibet. London, Luzac & Company Ltd., 1976, P. 151. ↑ "The Karmapa and Shamarpa Lineages" Retrieved on December 22, 2008. 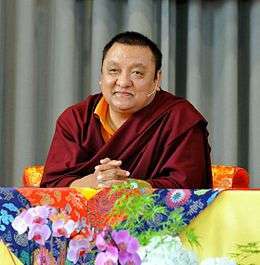 ↑ "Kunzig Shamar Rinpoche". Archived from the original on 2008-05-04. Retrieved 2008-05-23. ↑ "Bodhi Path: Presse zum Tod von Shamar Rinpoche". Bodhi Path: Presse zum Tod von Shamar Rinpoche. bodhipath-renchen-ulm.de/home/?L=2. 2014-06-25. Retrieved 2016-02-14.